An appeal for help with walking baby alpacas has attracted more than 50 volunteers. The alpacas Whiskey and Pep, must be walked and fed by volunteers so they can be more comfortable around humans. People came forward after an appeal was posted on the Facebook page of a shop in the village of Kingsland, Herefordshire, on Friday. 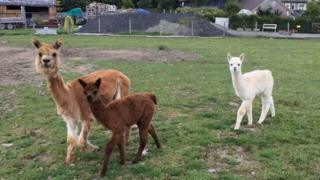 The cottage where the alpacas are kept, Kingsland Glamping at The Arbour, said it was "inundated" with requests. One of the cottage's owners, Jabez Dyer, said "it just went viral". He said: "It's still happening now. It was only last Friday, but people are still asking about it now. "Two local girls, they're local horse trainers and they thought what a great challenge to take on. "So they've taken it on and they're having a whale of a time doing it." The pair have been nicknamed the "alpaca whisperers" and are uploading video updates on Whisky and Pep's training to Facebook. The shop, Kingsland Village Shop, Post Office & Tea Rooms, is in partnership with the cottage, which accepts holidaymakers.